In the group at Protospace (FabLab Utrecht, the Netherlands) we designed and built a new extruder. Most of the design work was done by Robert, and a very good result was obtained with the first build. It could be changed to be slightly easier to build, but it’s just an afternoon’s work (when done for the first time). Click on the images to see a gallery with build details. The whole assembly. Design by Robert, ideas and live testing by Siert and Erik. Obviously we intend to share the design files. They are currently spread across multiple people’s computers, so please give us some time to post it (probably on Thingyverse). 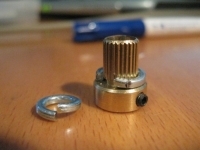 3 x 25 mm piece of Rod (diameter 8 mm, best without thread). Looks good. Can’t wait to see the STL files. It’s a 2D vector based design. We’ve already created several new iterations. I’ll see if I can get my friend Siert to publish a recent one on Thingiverse! 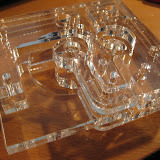 I’m designing and building a plexy-Mendel. Can you help me a bit about extruder? I want to keep it simple and use Bowden cable with nema17 motor. I checked Nophead and Wade extruder, but now i’m a bit in confusion. Do you have some simple design to start with? I can use a laser cutter.